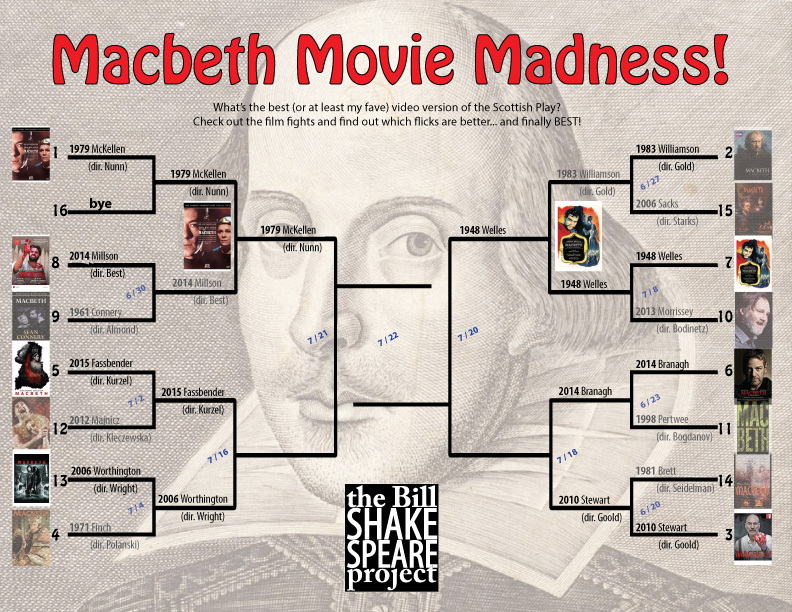 The Nunn version got here through a first-round bye (hey, there’s got to be some advantage to be the number one seed), and the Shakespeare’s Globe production edged out the Sean Connery version from the early 1960’s. Millson hadn’t blown me away in Shakespeare’s Globe, but I can’t say that about McKellen. His Macbeth is a marvel, a coolly ambitious man to begin, who becomes bothered by what he’s done immediately, and it shows. His decline and fall is so savage that we almost have sympathy for a man, who in those opening acts we might find fascinating but never care for. His Lady Macbeth is incredible as well, Judi Dench. Coolly ambitious herself, her fall begins not so much after the murder, but after her husband begins to distance himself from her, culminating in an absolutely riveting sleepwalking scene. This being a Nunn production, it’s dark visually. Presented much like the Othello from a decade later, it’s black-clad actors on a dark stage, harshly lit from the side so their faces are half-lit, half in the shadow. Only here, we get eerie organ music that made me think that I was about to watch Sweeney Todd. And while the Shakespeare’s Globe versions always make me feel that each actor knows exactly what they’re saying, it’s nothing compared to what Nunn has done with the actors here. There are line readings that display the same kind of knowledge but are also inventive, that made me hear the line for the first time, afresh. As for the cast, even beyond McKellen and Dench, there are great performances by familiar faces: Roger Rees as Malcolm, and Ian McDormand (the emperor from the Star Wars movies) as Ross.